One program can be used for both takeoffs from printed plans using a digitizer or on-screen takeoffs from a digital image. Takeoff is done graphically with every measurement recorded as a takeoff image for later recall or modification. See at a glance everything you took off visually on the drawing and as a report. Takeoff drawings can use multiple scales, layers and pages, permitting the user to create and organize the visual takeoff record to match the drawing sheet or in a manner more suited to his/her needs. 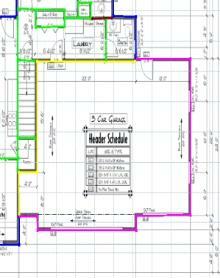 Complex roof plans are quickly and easily converted to lumber accurate material lists. No roof plan? Create your own using the roof wizard. Every piece is calculated and clearly shown on the takeoff drawing. Flooring systems are taken off and converted to BOM simply by using the flooring wizard. Every piece is calculated and clearly shown on the takeoff drawing. Multiple estimators can share the program across a network either within the same building, across town, or across the country depending on the type of network your store uses. PTO can be used in conjunction with many estimating programs as well as a spread sheet. State of the art programing techniques and software language ensures rapid ongoing development to incorporate new features and take advantage of emerging technologies.